Afghanistan is now Obama's War. He promoted it in his election campaign as the good war (in contrast to Iraq, the bad war). He sealed his ownership of it by ratifying his predecessor's decision to send more troops. His incoming staff dismissed prophecies that Afghanistan risked becoming a quagmire like Vietnam—consuming ever-larger numbers of troops for a steadily receding political goal—as unwarranted gloom. But as a make-or-break offensive gets underway in Afghanistan designed to neutralize the Taliban ahead of next month's presidential elections, similarities to Vietnam already loom. The epicenter is Helmand province. Helmand has strategic value: it guards the southern approaches to the capital, Kabul; it produces nine tenths of the opium crop that funds the Taliban; and the Taliban have held sway there for years. Tactically, the problem is that Helmand, sharing a border with Pakistan, offers the Taliban (and their allies) access or withdrawal at will. Operation Khanjar, as the U.S. offensive in Helmand is called, is already showing the hallmarks of failure. The 4,000 Marines there are finding it all but impossible to engage Taliban fighters in significant numbers; British troops, meanwhile, are getting picked off. These are, of course, early days, and painful years in Iraq have left the U.S. military vastly smarter in counterinsurgency than the "search and destroy" tactics of Vietnam. But what's taking shape in Helmand province looks like an old story—two old stories, actually. As in much of Iraq through 2006, the U.S. has enough troops in Helmand to clear visible adversaries but not to hold the captured territory. In a Pentagon briefing of striking candor, the Helmand commander, Marine Brig. Gen. Larry Nicholson, acknowledged last week, "You can't be everywhere." As in Vietnam a generation ago, the Marines are mounting dramatic helicopter-borne sweeps to get behind and cut off Taliban forces, but the Taliban are largely avoiding battle and melting away in classic insurgent fashion. "I can't tell you where they went," Nicholson said. Some Taliban fighters will have sunk back into the local population, but others will have retreated across the open border. Pakistan has no forces there to deny them that sanctuary. CENTCOM commander Gen. David Petraeus had hoped for a "hammer and anvil" strategy with Pakistan (U.S. forces in Afghanistan as the hammer; Pakistani forces as the anvil). But Pakistan's regular Army is tied down in a grinding struggle to drive insurgents from its tribal areas, while its frontier force is either unable or unwilling (probably both) to take on the retreating Taliban. Victory, in any useful sense, will likely prove elusive in Helmand. Unlike Iraq before the surge, there are probably enough American troops in Helmand, at least to clear the territory. What Nicholson lacks, however, are the Afghan troops crucial to the next phase: occupying it. "I'm not going to sugarcoat it," he said. "The fact of the matter is, I—we—don't have enough Afghan forces, and I'd like more," ideally as many Afghans as U.S. troops. Instead, he has not quite 650 to parcel out among his 4,000 Marines. But, Nicholson said, more "are just not available right now." That shouldn't be the case: Americans have supposedly trained 82,000 Afghan troops. Of these, according to a Pentagon report in January, 43,000 were thought to be capable of operating either independently or with support. But Afghan President Hamid Karzai committed only a fraction of these to the biggest anti-Taliban offensive since 2002. American commanders in Afghanistan have pleaded for more, Nicholson indicated. "We've made, frankly, as good a case as possible," he said. 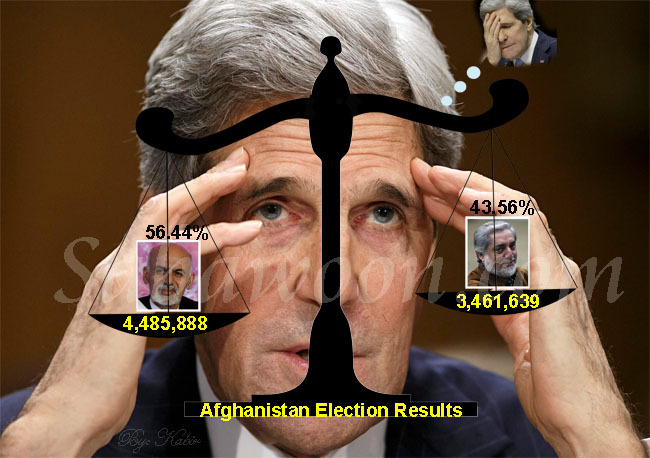 But "the decisions about where these Afghan forces will go are not made by any U.S. commander. They are made by the Afghans. This is a sovereign government." This should sound familiar. A sovereign government less willing to fight insurgents than the U.S. forces trying to support it summons, of course, uneasy memories of Vietnam. What it means in Helmand is that the Marines are largely blind. Nicholson knows he needs native help to find the Taliban who are hiding among the population: "Another reason you want Afghan troops is because they can see guys on the street and tell you that this guy's not a local. … We're never going to be able to do that. But they can identify that [guy] right away. So it takes away the enemy's ability to hide." U.S. commanders hope that the Taliban will eventually have to show themselves to harvest opium, which Nicholson calls "the engine that drives the Taliban." But the opium is harvested by hundreds of small farmers. "The Taliban leaders think that once the Marines and the Afghan security forces start confiscating caches of opium in people's houses—their livelihoods and the only security that they will be able to feed their children—villagers will be more than happy to help the Taliban," Yousafzai reports. Plus, the locals know that, whatever the U.S. promises now, the Marines will eventually move on, whereas the Taliban won't. As in Vietnam, the question of how many troops the U.S. must commit to Afghanistan is already shaping up as a political quandary for President Obama. In March, he agreed to send 17,000 additional combat troops, plus another 4,000 to train the Afghans, bringing the total to 68,000. The White House has made it clear that Obama will not welcome calls for more. Yet the new U.S. commander in Afghanistan, Gen. Stanley McChrystal, already believes he needs several thousand more. He reportedly wants to double the size of the Afghan Army from the planned 134,000. That would cost billions of dollars and require thousands more Americans to train them. Inevitably, the question after that will be how many U.S. troops are needed in Afghanistan until those Afghan forces can take over. The latest poll suggests that two of three Britons support pulling out of Afghanistan. As casualties mount, so will the pressure on Brown to set a withdrawal date. The White House is sufficiently alarmed by this prospect that President Obama has been trying to give Brown both public and private support. But General McChrystal's report on the situation, due in August, is likely to present Obama with his own set of political challenges. Obama's War isn't going well.